The Buffalo Valley Regional Police Department, like most Law Enforcement departments, knows just how long it takes to manually write reports and citations. 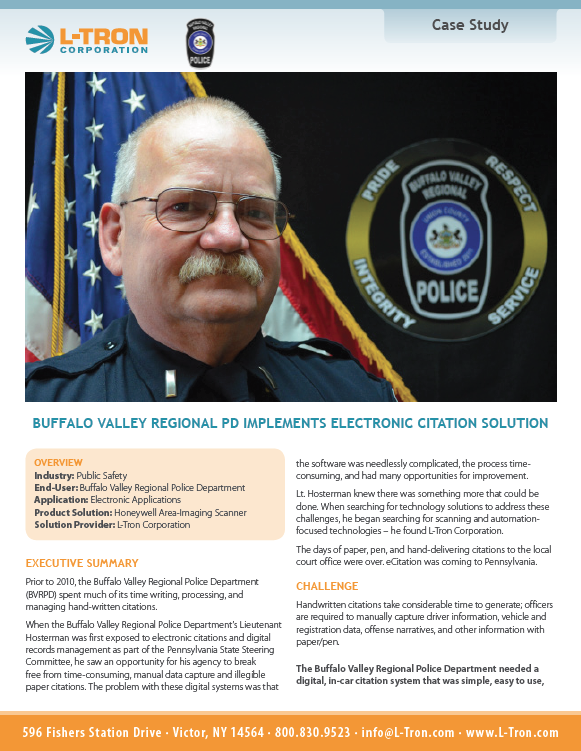 Rather than continuing to hand-write citations, the BVRPD turned to an electronic citation solution – eCitations – to execute their citation needs. As a result, the BVRPD noticed a significant increase in citation efficiency and accuracy, while spending less time on each citation. Continue to read this case study to find out how L-Tron and the BVRPD partnered to create the perfect eCitation solution for their specific needs.